While planning our vacation to Great Britain, we considered traveling by train and by car. Being a family of four with two small children and given the distance we wanted to travel, it turned out to be much more economical to rent a car. And if you consider the freedom a car provides for exploring the countryside, our decision was simple. 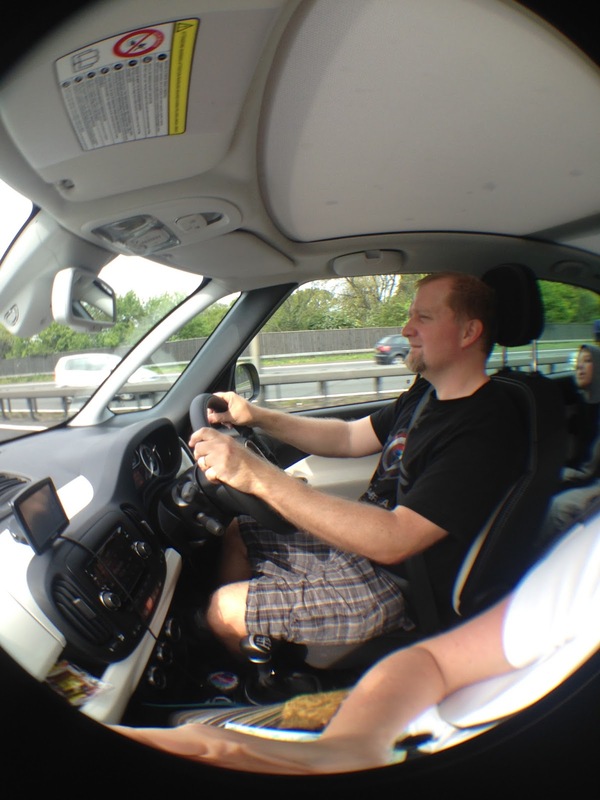 We ended up reserving a car from Europcar at the Heathrow Airport. According to our sources in-country, car rentals are cheaper when renting from the airport as opposed to city centers. Europcar gave us a TomTom GPS with the rental. The Points of Interest (POI's) on TomTom's are, in our opinion, unreliable at best (we were reminded of this more than a few times on this trip!) With our cell coverage in the states, we can validate routes via google maps on our smartphones. But here in Great Britain, we found cell coverage to be much more sketchy between denser urban areas. It is possible our GiffGaff provider had something to do with that, nevertheless, an accurate, fully-functioning, dedicated GPS device can save you some frustration. Regarding the car itself, we had our pick from a dozen or so available. 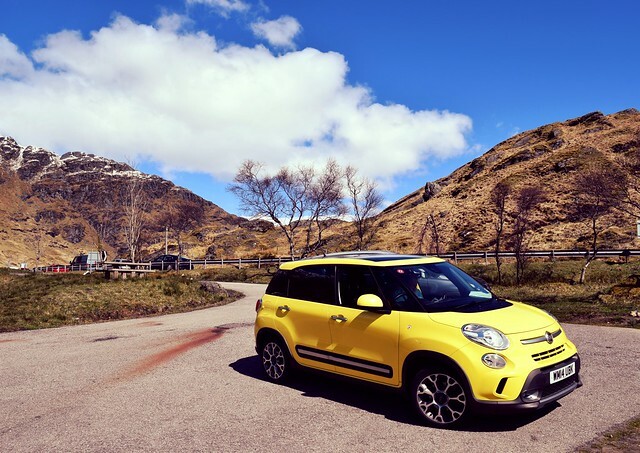 As we perused the options before us, my eye was drawn to a yellow Fiat, not so much because of the color - though that turned out to be helpful - but because it had more big windows and sat up higher. In my mind, that made it a better choice for sightseeing. It wasn't until we were underway that I realized it also had a glass roof that opened. And the yellow color - well, if you are in an unfamiliar vehicle it is nice to have a nice bright color to help draw your eye when searching for it in a large carpark. For Americans used to driving on the "right" side of the road, driving around Great Britain can be mind-boggling at times and not just because of driving on the left. It seems that most of the automobiles in Great Britain have standard transmissions. Rental cars with automatic transmissions cost twice as much as those with standard transmissions. So my beloved husband had to sit on the right and shift with his left hand. Fortunately, the gas, break and clutch pedals were in the same formation and the gears are oriented just as they are on an American car. So unless you are prepared to pay the price, American drivers must adjust to these changes and quickly. Simultaneously, American drivers must also familiarize themselves with unfamiliar signage and traffic patters. For instance, when you see this sign what would you think it means? Well, my first thought is that it means "STOP!" Don't go this way, etc. This can be very confusing as you negotiate your first roundabout on approach to a motorway onramp. As the caption states, in Great Britain this means no stopping. And roundabouts are EVERYWHERE! Some look like normal roundabouts that you would see in the US. Then you have the roundabouts that are circles painted on the pavement sometimes not even a foot in diameter. So go around that bit of paint! - seriously! Every time you come to one of these you must treat it the same way as a "normal" roundabout. And then there is the double roundabout - I'm not even going to try to describe this! Note the sign in the following photo - and this one isn't even so bad. Once comfortable with these, the benefits of roundabouts become clear as traffic does keep flowing, but it takes some getting used to. There are traffic lights at larger roundabouts and some pedestrian walkways. Instead of a changing from red to green to yellow, there the pattern is red, yellow, green, yellow. So you get an extra yellow to tell you to "proceed slowly" or "go cautiously" or "prepare to go" - I'm not sure - pick one. My chauffeur liked this change though. Note the caption. The national speed limit in Great Britain for single carriageways is 60 miles per hour! Supposedly Brits are stuffy and conservative, when in fact they have legalized the game of chicken! Here is a video from one of our rural drives on a single carriageway northwest of Inverary in Scotland. We did not meet an oncoming car in this instance but we did at other times. My very conscientious husband is going well below the 60 mph speed limit in anticipation. If you are an American planning to rent a car for your travels in Great Britain, I hope this helps. Some bottom line reminders: drive on the left and look right before entering ANY roundabout. Safe travels!